Sleep Apnea is a common sleep disorder known to cause regularly repeated interruptions in breathing during a normal sleep cycle. At C2C Sleep Solutions we offer screening, testing, treatment and continued care. It is our mission to bring people a better nights rest and treat the symptoms of sleep apnea. 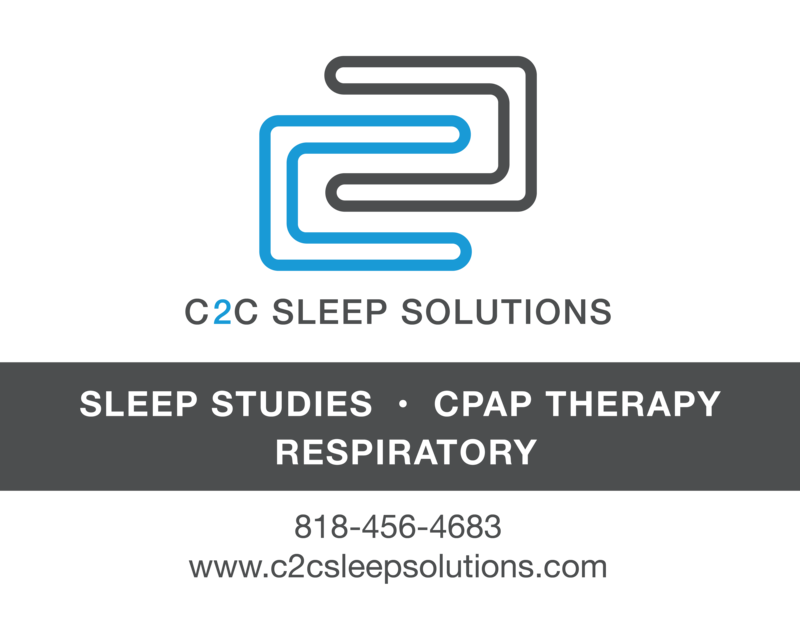 C2C Sleep Solutions works with both patients and providers to offer top of the line sleep apnea testing and treatment options. Our testing and treatment for sleep apnea offers a better quality of life for our patients. C2C Sleep Solutions is dedicated to helping patients breath and sleep better at night. Many people have sleep apnea and have no idea they are experiencing the symptoms of the condition. Many believe it is a condition for people who are overweight, but this is a misconception. If you’re not sleeping well at night this is the first sign that you may need to be tested. There are many choices in testing and treatment options for sleep apnea and we are committed to helping our clients find the right program for their needs. At C2C we have providers all over the Nation dedicated to helping people sleep better and get the healthcare they deserve. One of the areas we help treat you is through products designed for Sleep Apnea. We have cpap products like remzzzs mask liners, Contuour cpap max pillow, travel cpap machines, and resmed air mini. If test results confirm your suspicions then the next step is to treat the diagnosis. All of our products are created to help you live a better life. Sleep Apnea is a common disorder which causes a disruption in a normal breathing cycle while you sleep. These pauses of breathing limit the amount of oxygen that reach the lungs. 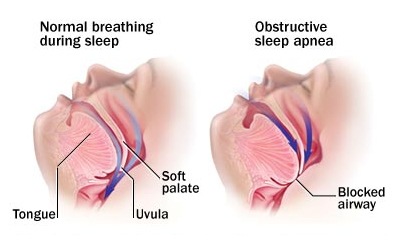 The most common form of Sleep Apnea is known as Obstructive Sleep Apnea. This is characterized as the failure of the muscles in the back of your throat to keep an open airway. 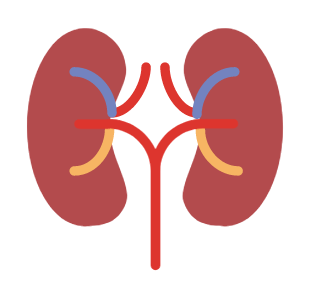 Other types exist as well such as Central Sleep Apnea or Complex Sleep Apnea. 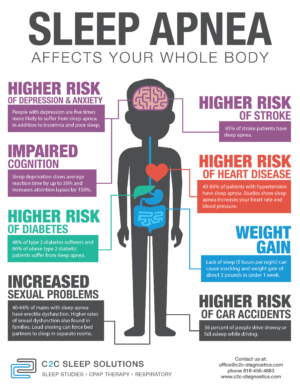 If left untreated Sleep Apnea can increase risks in your life like extreme fatigue, memory problems, or even high blood pressure. Sleep Apnea is difficult to self-diagnose because it occurs while you sleep. Although it’s is important to seek medical advise you can keep a tract of your sleeping cycle. In order to treat the diagnosis with CPAP Machine, your doctor or insurance will want to perform a Sleep Apnea exam. The exam usually consists of monitoring your breathing while you sleep. The most convenient exams are the ones done at home. 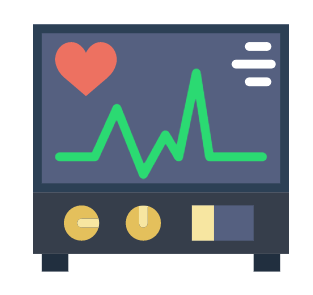 The at home monitor will collect various factors that could be affected by Sleep Apnea like heart rate, blood oxygen level, and breathing patterns. Other exams can also be performed such as a sleep study at a sleep center known as Nocturnal Polysomnography where sensors are monitoring you. C2C provides a convenient at home study that can be easily obtain by simply contacting us. 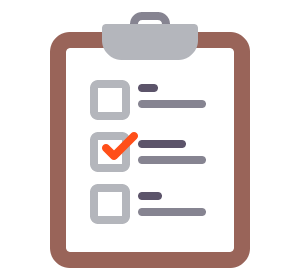 If you feel you are a candidate for Sleep Apnea then it is important to take a sleeping test so that treatment may begin as quick as possible if the exam results are positive. CPAP Machines is the most common device to treat Sleep Apnea. 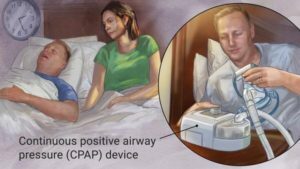 CPAP stands for “continuous positive airway pressure”. 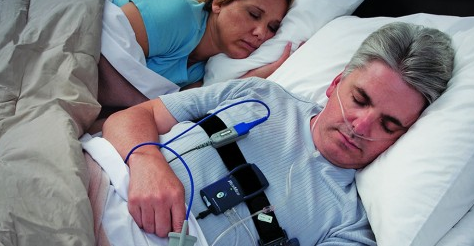 After a diagnosis is determined through a sleeping test you are eligible for a CPAP machine. 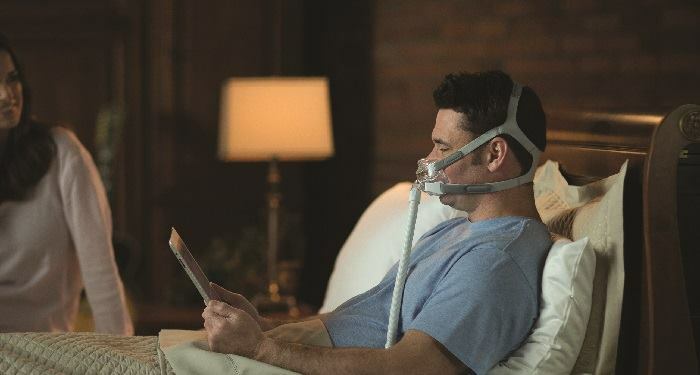 The CPAP is a mask worn while you sleep that helps maintain a constant air pressure in attempt to prevent snoring or interruptions in breathing. At C2C Sleep Solutions we offer a variety of products and with the help of our experts you will be recommended products accordingly. Using these machines can ensure a better night’s sleep and lower risks associated with the disease.